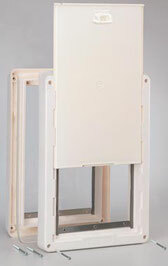 Ideal Pet Doors are inexpensive and represent a good value for the quality construction. If you need a pet door but are on a tight budget, Ideal pet doors may be the solution you're looking for. 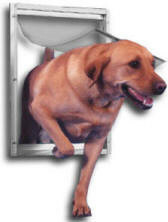 We can also order replacement parts for Ideal pet doors, and offer full installation services. 5 3/8" x 9 1/4"
9 3/16" x 14 3/4"
12 3/4" x 18 5/8"
17 1/8" x 23 1/8"
The Ideal Deluxe Series Pet Doors have a flap which is relatively light, making it particularly appropriate for sharing between small and large pets. It is also clear and not tinted. A long magnet across the bottom pulls a metal strip crimped to the bottom of the flap. This feature may serve to identify the pet door as it is unique. A metal frame supports the flexible, vinyl flap across the top. Replacement of the flap is easy though it's important to choose the correct flap (see ideal deluxe and original flaps). A plastic locking cover provides a good seal when in place. The Ideal Ruff Weather Dog Door includes an all weather injection molded structural foam adjustable frame, weather seal gasket and nylon window pile for added insulation. There are two flaps: One is located on each side for better insulation and wind resistance value. There is also one locking cover. The magnet bar at the bottom 'floats' up to the bottom of the flap for a better seal at the bottom of the flap. This pet door is available in four sizes and will accommodate small pets to very large dogs. When installed, it will protrude about 3" from the face of the door on both sides.